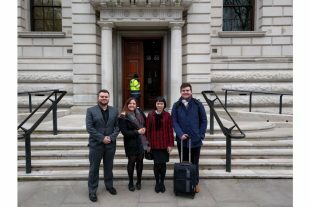 For National Apprenticeship week (March 14th-18th) the Fast Track marketing team created the Great Apprenticeship Takeover to help promote the Fast Track scheme. The challenge was an opportunity the 5 Fast Track apprentices in Edinburgh CCO (Hanna, Tracey, Rebecca, Laurie and myself) could not refuse as it was a fun ways to develop our leadership and organisational skills. The challenge consisted of three strands: Keep it social, Keep it local and Keep it street. We started with an induction day at 1 Horse Guard Road (The Treasury), briefed on each task and given a talk on project management. It was very exciting walking around Whitehall and listening to interesting people with so much experience to share. In ‘Keep it social’ we had to use social media to raise awareness and post content to engage the public and show the great opportunities the programme has to offer. We created Facebook and Twitter accounts with great success. 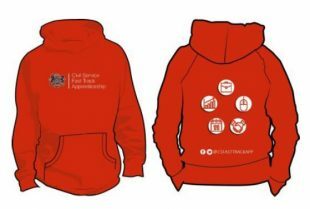 ‘Keep it street’ was the more creative part of the challenge where we had to design a hoodie for fast trackers to wear at promotional events. We went for a simple design that included the links for the Fast Track Facebook and Twitter pages on the back. The final strand was ‘Keep it local’. This involved raising awareness on a smaller scale by doing talks at local schools and Skills Development Scotland. We attended a careers fair at Armadale Academy and gave talks at the job centre on St Andrews square. We set up a table with posters and brochures at both events and talked informally to interested people. ‘Keep it local’ was a more time consuming method of promotion however I feel it was more effective as you could really relate to people on a more personal level. The Great Apprenticeship Takeover was a great experience that benefited my development and I thoroughly enjoyed it.